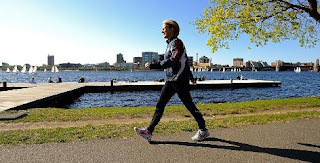 Miriam Nelson, 49, director of the John Hancock Research Center on Physical Activity, Nutrition and Obesity Prevention at Tufts University in Boston says that a brisk walk may lower womens' risk of stroke and prevent the dreaded middle-age weight gain. These findings join a long list of reasons why you should remain physically active. Many women complain about gaining weight during and after menopause, but a recent study found that some normal-weight women were able to prevent weight gain by doing an hour a day of moderate-intensity physical activity such as brisk walking. Walking - Almost nothing is easier and cheaper than walking, but that means you need to get the lead out and put some spring into your step. Weight training - Lifting weights benefits the body in numerous ways, including improving bone, joint and muscle health; boosting the immune system; reducing depressive symptoms; and improving sleep. You can do as little as two sessions a week at a local fitness center or lift weights at home, Nelson says, but make sure you're challenging yourself and lifting enough weight. Another great option: exercises that you can do in you living room while watching TV or playing with the kids like sit-ups, lunges, squats, push-ups and pull-ups. Use the "Exercise Videos" search on the front page to look for more exercises you can do at home. Diet - Middle-age is certainly not the time to ignore your diet. One of the major keys to avoiding middle-age spread: closely monitoring your caloric intake, Nelson says. By far the biggest culprit of weight gain as people age is eating too much, she says, especially foods high in sugar and added fat. 0 Response to "Women: Walk your way to life-long fitness"